Turmeric is the spice that gives Indian food or the mustard on your hot dog a yellow hue. However, this spice does more than just make your curries and condiments look and taste good, it also offers a range of health benefits. One these is reducing the inflammation that arises from wounds, skin problems and even conditions such as arthritis and cancer. Consult your health care provider before using turmeric to see if it would be a suitable treatment option for you. Turmeric contains a substance called curcumin and, according to MotherNature.com, curcumin reduces or stops inflammation caused by some conditions, such as headache, arthritis and gout. Many people use aspirin or ibuprofen to reduce inflammation caused by these conditions, however, according to MotherNature.com, there is a chance these medications can stop the blood from clotting and/or cause high blood pressure. Turmeric, on the other hand, is unlikely to cause these side effects, but consult your doctor before taking it as a treatment for these conditions. Followers of Chinese and Ayurvedic medicine have been using turmeric for centuries to treat inflammation in a variety of forms and in all parts of the body. MotherNature.com suggests using turmeric externally, rather than actually eating it, to treat inflammation caused by skin infections such as acne. Simply mix the spice in powdered form with a little water until it becomes a paste and then apply to the affected skin. Do a patch test to make sure you are not allergic to turmeric before using it on your skin. The curcumin in turmeric can also ease the swelling associated with wounds and help them heal faster, states MotherNature.com. When you cut yourself, your body sends extra blood and white blood cells to the area to knit the wound together and fight infection. But this process can cause inflammation, which slows the healing process down. By applying turmeric paste to the area, you can ease swelling and help your body heal faster. According to the Mayo Clinic, inflammation and swelling can be symptoms of more serious conditions, such as cancer. So with its proven inflammation-fighting properties, curcumin is currently being studied as a possible cure or retardant for some cancers. This research is in its early stages and the Mayo Clinic recommends talking with your doctor before taking turmeric or any other herbal supplement to treat or ease this condition. Applying turmeric to your skin is fine for treating external conditions, but you need to ingest it in order to ease internal inflammation. The solution certainly doesn&rsquo;t involve eating mustard hot dogs or curry for every meal, but sprinkling a little turmeric into other dishes&mdash;such as lentils or spaghetti bolognaise and on pizzas&mdash;is a good start. To truly feel the anti-inflammatory benefits of this spice, DrWeil.com suggests making your own turmeric tea. To make it, add 1 tsp. of ground turmeric to four cups of boiling water and simmer for 10 minutes. 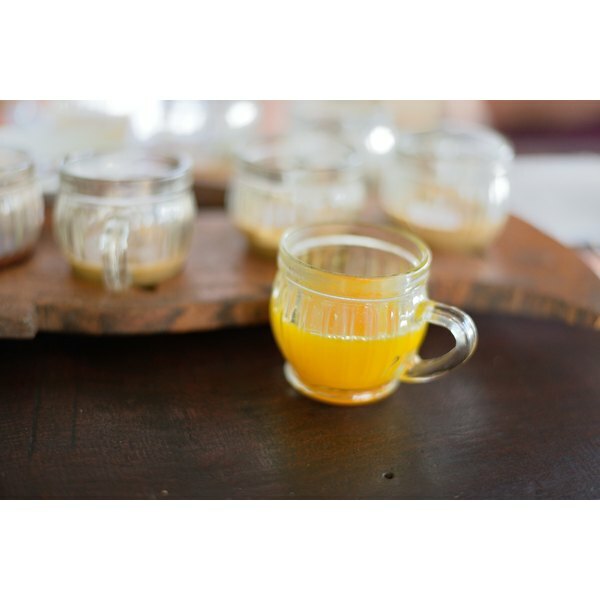 Strain the tea through a fine sieve into a cup and add honey and/or lemon to taste. Mayo Clinic: Can Curcumin Slow Cancer Growth?